Moynalvey’s Thursday night journey to Nobber for this Div. 2 B League second round game played under lights proved to be unsuccessful as the home side ran out eventual twelve point winners. A final quarter scoring surge saw Trim take the two points on offer in this Div. 2 B League opening round game played at St. Lomans Park on Saturday afternoon February 23rd. 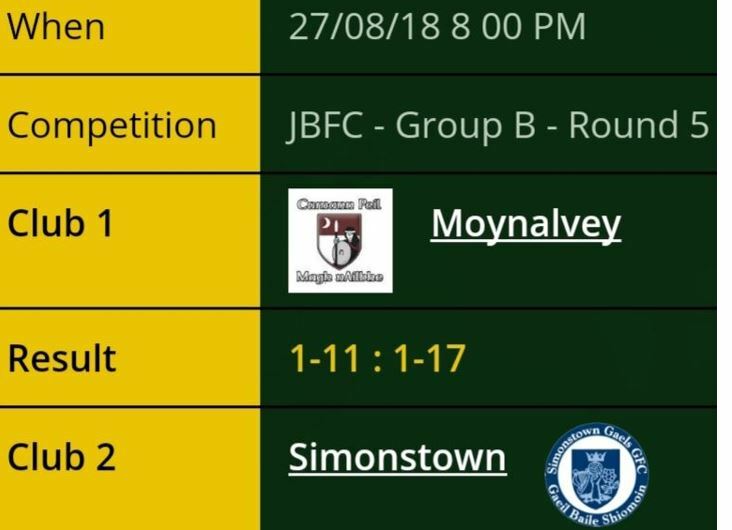 Moynalvey lost out to Simonstown Gaels on a six point margin in this Seamus Connolly Junior ‘B’ Football Championship Group B final round group game played at Dunganny on Monday night August 27th. Moynalvey went down tamely to table topping Seneschalstown in this Div. 2 B League game played at Moynalvey on Monday evening 28th May.